Introducing the Lava Squareleaf HD-400 Indoor HDTV Antenna. 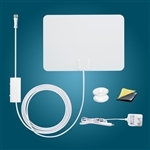 The Squareleaf flat HD antenna receives all VHF and UHF TV Signals within 35 miles or more. We have tested dozens of indoor antennas and have found the Lava Squareleaf to perform exceptionally well in situations with lots of interference. Excellent reception on both VHF and UHF TV channels. With easy sticker for convenient multi-positioning,such as window, table and wall, etc.. Specially Compatible with HDTV of various digital terrestrial (DVB-T.ISDB-T,DMB-T/H,ATSC) and DAB/FM radios. 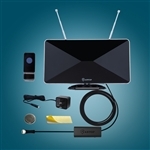 can easily mount the antenna on the wall, windows or even behind your TV. Our customers love the slim design and ease of installation with the HD 400, and you will too! The HD 400 Squareleaf Indoor Television Antenna is sleek, unobtrusive and works great in condos, apartments, and homes within the city. I was amazed at how well the little indoor antenna, placed at the top of a window can provide access to 48 channels without any problems. NBC has 2 or 3 channels one being weather. RESPONSE: Call us for antenna suggestions at 1-800-542-6379. many factoirs come into play with indoor antennas. I bought the indoor digital tv antenna for 35 dollars, while I did not get one of the channels I was wishing for, I am able to receive almost 10 channels. First day, I watched surfing that night SNL and I am still using it with a great deal of pride. Thanks. I am interested in hearing any options in the future for upgrades for example I have a Bose wave radio and I really would like to pick up some beach music stations and jazz stations that are out of reach. Any ideas? RESPONSE: Try an Outdoor Antenna, they are more powerful and the signals are stronger outside. Doesn t work at all . just wasted my money. RESPONSE: Alan, There is signal in your area. The 400 should pull in something, Call us for Support. To get all the avilable channels I recommend a more powerful antenna or an outdoor antenna. Call Us at 1-800-542-6379 for help with your antenna. I thought from the reviews this would be able to pick up all the channels. I could only pick up 6, the websites app was great to see how far away the towers are. That could be the reason I couldn't pick up many.